Stay at one of Rent a Cottage’s fabulous self catering holiday homes and enjoy endless options for walking based holidays in the fresh air and stunning scenery. There are so many walks both near the Wild Atlantic Way and inland, visitor are spoiled for choice! Starting in County Mayo on Achill Island there are gentle walks on Keem and Keel beaches. When walking in Achill the first thing that one notices is the ever changing colours on the protective hills nearby the beach. This is one reason Achill Island is a favourite amongst landscape painters and writers. Even on a blustery day it is possible to take a relaxing walk and if the weather is calm it is simply sublime. 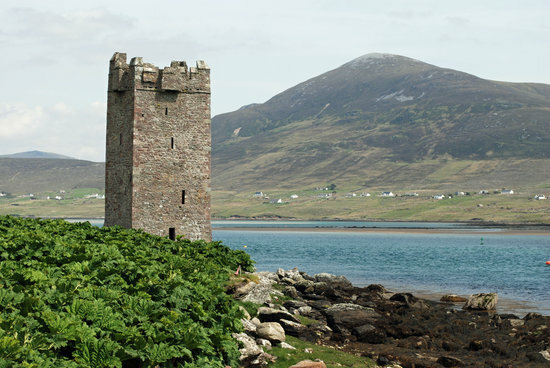 The natural beauty of the Island changes dramatically along the northern stretch and uphill walking near Kildavnet castle. When walking around Achill watch out also for the natural flora of the island that is in full bloom from May – October. It is small and can be missed but some of the tiny flowers are stunning and only grow on this island. The Clifden and surrounding area in Connemara is a walker’s paradise, Connemara National Park and Kylemore Abbey include walks for every level and age group. Kylemore Abbey features an award winning Victorian garden and a tour up the mountain to the statue can be pre-booked by phoning ahead: Connemara.net. Connemara National Park has a guide on their website listing the walks in the park and surrounding areas between the national park and Clifden. Personal guides can also be booked with the Connemara National Park. Favourite walks in Clifden include the Derrigimlagh Looped walk,. The Connemara National Park has a service that helps visitors choose walks and hikes. After a great day of exploring it is time to stop in for a pot of tea and scones or a rewarding meal in one of the pubs that serve award winning dishes and a lively atmosphere no matter what season it is. Local favourites in Letterfrack include Veldon’s and Mollys and in Clifden Guys Bar. There is always a lively atmosphere in the restaurants at night and many offer live music nightly.